The people of Papua New Guinea woke up to 2018 as the ‘year of APEC’. The thought of having some of the world’s most powerful leaders descending on the rough yet fertile soils of PNG appeared unreal to many, but blissful to some. The assurances of what it would mean for the country were a notch higher, with the government promising social and economic transformation. The population was divided: some driven by pride curiosity supported the cause; while others, unable to quantify any meaningful progress on their daily challenges and amidst failing social infrastructure, remained sceptical. 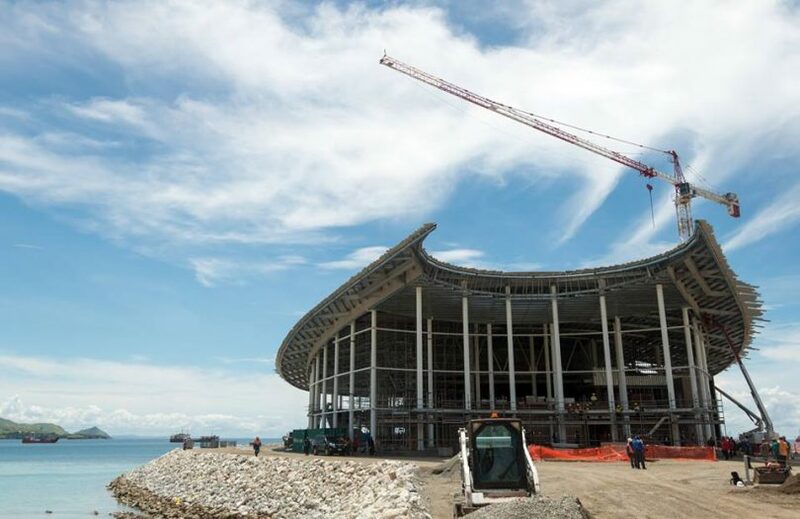 The APEC show began with new hotels erected, roads paved and the construction of the spectacular APEC Haus on Ela Beach. These were some of the most significant infrastructural developments the country had ever seen. Security was amped as political leaders urged residents in Port Moresby to embrace the foreign tides that were about to visit its shores. But buried away from the APEC limelight were the country’s realities. A weakening health system that was unable to prevent the return of polio from its long absence; the simmering tensions in local communities from the controversial elections in 2017; and the daunting offshore loans that will continue to burden future generations. These were just a few of the ‘demons’ that haunted the country as it braced itself for some salvation though APEC. As polio made its unwelcome entry into Port Moresby, the contrast became stark – a booming city under the spell of a global event was also under threat from a killer epidemic. As it turned out, the polio threat was contained, but the message was clear – there is chronic negligence in the delivery of basic services in the country. In June, the country’s security and social fragility was brought to the fore with the burning of a passenger plane in Southern Highlands province following a court decision against a candidate who disputed the outcome of the provincial seat in the 2017 election. The supporters of the candidate also burnt the province’s National Court House and the residence of the Governor, and destroyed properties belonging to Prime Minister Peter O’Neill. In response, the Government declared a state of emergency and deployed soldiers to the scene. Only four months away from the much-anticipated APEC meetings, these were no ordinary events. They appeared to represent the deep distrust and resentment among the people against institutions and representations of power and governance in the country, including the system of justice. As APEC drew nearer, another controversy engulfed the embattled yet highly optimistic organisers – the ‘Maserati affair’. It came about as a result of forty Italian Maserati luxury cars being purchased at an exorbitant price – vastly unsustainable in PNG post-APEC. What followed were reckless assurances from the Minister of APEC as the country came to grips with the Government’s habit of undertaking costly exercises yet being unable to adequately fund basic services. APEC itself was successfully delivered, without any major incidents during the two-day event. For that, credit goes to the Government and all the support agencies, both from the public and the private sector, including foreign governments. However, in hindsight, PNG will need to carefully reconsider undertaking another such event in the future. Ambition and pride aside, the country needs to take a sensible approach to its development and investment priorities. The storming of the Parliament by some members of the police force over non-payment of APEC-related allowances less than 48 hours after the event demonstrated the need for such sensibility. It was reported around the world, and did a lot to undermine the good impressions the Government had worked hard to create during APEC itself. Domestically, the incident not only hinted at the institutional challenges facing the country, especially with regards to law and order, but also represented distrust in the institution of Parliament, those that occupy it, and what it represents. These attacks on constitutional institutions – the storming of Parliament and the burning down of the National Court House – call for an awakening and self-assessment as to the realities facing the country and a greater responsibility on those in leadership positions. One such reality is the growing weakness in anti-corruption efforts, which some would argue, was vividly depicted in the recent exoneration of fraud charges against Paul Paraka. It was a case that, until December 2017, also implicated the Prime Minister in what appeared, at that time, to be the biggest corruption scandal in the country’s history. Another reality is the weak state of the PNG economy. Formal sector employment is back at the level seen in 2011, even though the population is now some 20% bigger. The government continues to talk up the economy, and push forward international loans and mega resource projects, but the lived reality of the population naturally makes them sceptical. A positive outcome from APEC was the competition among those seeking strategic advantage over PNG. China continues to leave big footprints in PNG in terms of solid infrastructure developments. The partnership between Japan, New Zealand, Australia and the US to undertake an electricity project in PNG could be a game changer in terms of public perception of the allies, and PNG’s own development. In addition to overcoming the potential geographical and governance challenges, the partners will need to ensure that the project is not only delivered as promised but that it is delivered at a higher standard, to distinguish themselves from the Chinese-sponsored projects often accused of being low quality. Ultimately, however, PNG cannot be rescued by competing “big brothers”, but will shape its own future. The achievements, lessons and promises of 2018 and the kind of future it will shape for the people of PNG remains to be seen. What is certain is the desire among the Opposition to remove the O’Neill government. The impending vote of no-confidence due in February 2019 and the Bougainville referendum later in June are likely to stir new dramas. As Christmas carols serenade the neighbourhoods of Port Moresby, some will be plotting the looming political change in the New Year, while others will party with the spoils of corruption. As for the majority of the people across the country and in the forsaken villages, Christmas will be a time of happy celebration but also just another day in their long struggle to see light at the end of their tunnels. I believe the issue here is a lack of ownership of Papua New Guinea as a nation. Our loyalties are to our clans, tribes, districts, provinces in that order. Those of us who have not had the opportunity to study, work or live overseas do not identify ourselves as Papua New Guinean. The difference between this generation and those who grew up before independence is that we are not united behind the cause of PNG Inc.
Those who grew up before Independence felt what it was like to be a second class citizen in their own country. They grew up in a time where there were signs that made places like Ela Beach out of bounds to dogs and natives, in that order. Interesting year for sure. A year of great political awakening.